That's how abdominal muscle training makes fun: The FitWood abs machine made of Nordic birch wood strengthens your abs while rolling back and forth and looks quite nice so that you love to do a regular training. With respect to the handles, you can choose between aluminium and steel. Complete your fitness equipment with this special exercise wheel of Finnish design. 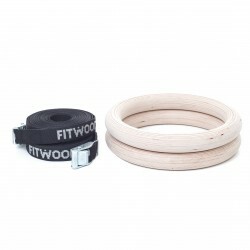 Do a versatile and effective training with the own body weight using the FitWood gym rings. Being a part of the functional fitness, the body weight training is an important addition for many types of sport. 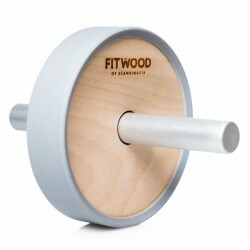 The FitWood gym rings made of sturdy and nice birch wood have a really good grip - it's ideal for chin-ups, dips, and push-ups. 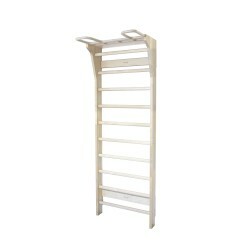 Using the provided tubes, you can ideally mount it to the FitWood wall bars or a chin-up bar. 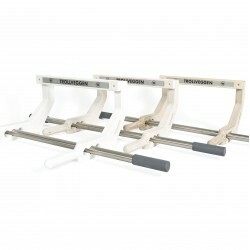 The FitWood chin-up bar is a sporty multi-talent: It is easily mounted over the door frame for doing chin-ups. Being placed on the floor, it serves additionally as a nice push-up handle. In its combination of sturdy birch plywood frame and stable stainless steel bar, it combines sturdiness and strength with a puristic design. 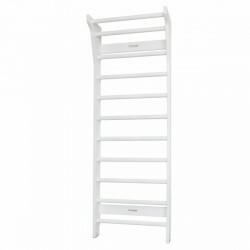 You can choose from the chin-up bar in nature, glazed or white surface appropriate to your furnishing. Offering Trollstigen, FitWood succeeded in combining the classic wall bars with a modern design. Being made of sustainable, Baltic birch wood, the FitWood wall bars is a highlight at your home - either for gymnastics or stretching exercises, chin-ups, dips, abdominal exercises or as sport and playing equipment in the child's room. With respect to the wood, you can choose from black, white, and nature. You can select the wall bars appropriately to your furnishing. The gym rings are a great upgrading for the FitWood wall bars with chin-up bar. Bring more diversion to your strength training with strength handles and traction aids. The Finnish manufacturer has the appropriate gym rings in its range of products as accessory for your FitWood chin-up bar or wall bars. The mounting tubes are already included. Set new impulses for your strength training witih the FitWood gym rings. Push-up handles protect the joints, offer a safe stability, and make the exercises more efficient. Being inspired by the Scandinavian nature, the FitWood push-up handles made of birch wood convince by their simple, classic design. Using a chin-up bar or the gym rings, you decide for the multi-functional training machine, which can be used as push-up handles as well as for many other free exercises. In the following selection, you have the possibility to find documents (for instance, instructions or test reports) about the products of the manufacturer FitWood. Please select the product, for whose documents you are interested in, from the column "products".